“The Walking Dead” made the leap from cult comic book to mainstream phenomenon last fall when the TV adaptation debuted on AMC. With this gritty take on the concept of what happens to the world after most zombie movies end, writer Robert Kirkman has crafted a compelling and realistic tale with believable characters and lots of interesting twists. Kirkman is aided in this by artists Tony Moore and Charlie Adlard, who bring his scripts to life with great layouts and very effective and moody black-and-white art. 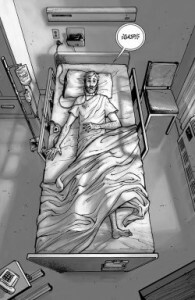 The central Character in “The Walking Dead” is Rick Grimes, a small-town police officer who wakes out of a coma in the hospital having missed the big zombie apocolyptic event. Disoriented and alone, he sets out to try and find his family. As the series progresses, we meet other survivors of the zombie onslaught, and learn more about their pre-zombie attack lives. 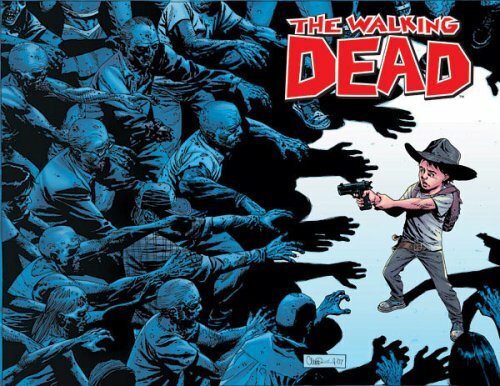 “The Walking Dead” began as a monthly comic book in 2003. 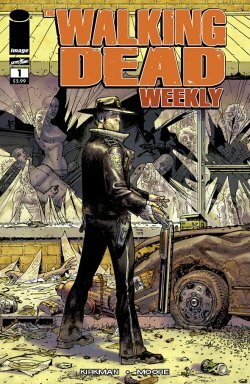 Due to the success of the television show, Image Comics is reprinting the series as “The Walking Dead Weekly,” beginning this week with the first issue. This is a great way to catch up with the series and find all the similarities and differnces between the comic book and the TV show. If you get so hooked that you don’t want to wait a week between installments, “The Walking Dead” has been collected in a variety of trade paperbacks and hardcover editions, all of which can be ordered from our friends at Taylor Books. A five-page preview of the first issue of “The Walking Dead Weekly” can be found at Comic Book Resources.